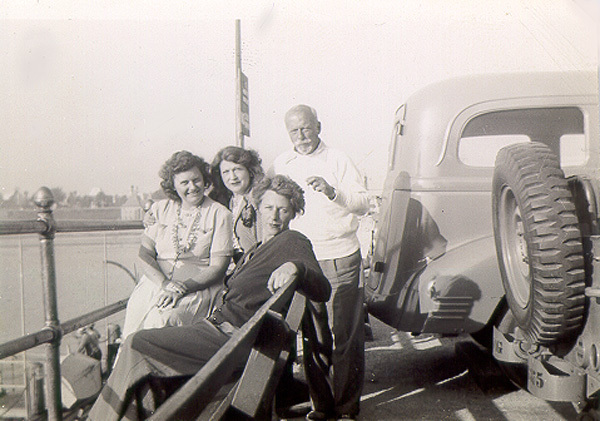 Esther McCoy (foreground) with husband Berkeley Tobey, Vera Dreiser (left), and Helen Dreiser, September 5, 1949, pier at Santa Monica, CA. Courtesy of Theodore Dreiser Papers, Rare Book & Manuscript Library, University of Pennsylvania. Esther McCoy (1904–1989) was one of the foremost architectural writers of the twentieth century. A gifted literary stylist and keen social critic, her work recognized the genesis of American modernism, witnessed the birth of mid-century design, and ignited public awareness. McCoy's book Five California Architects (1960) has long been acknowledged as an indispensable classic. As Reyner Banham declared, “No one can write about architecture in California without acknowledging her as the mother of us all.” Throughout her sixty-year career, McCoy worked variously as an author, editorial scout, lecturer, screenwriter, architectural preservationist, and exhibition curator; her life charted the progressive edge of American idealism from the utopian spirit of Jazz Age Greenwich Village through the radical evolution of post-war architecture. Esther McCoy: A Modern Life is the first biography of this significant American original. Susan Morgan has written extensively about art, design, and cultural biography. Her work has been featured in exhibition catalogues, artist’s monographs, and mainstream publications ranging from the New York Times to the World of Interiors. With Thomas Lawson, she cofounded and coedited REAL LIFE Magazine, an alternative-art publication produced throughout the 1980s. A former contributing editor for Interview, Mirabella, and Metropolitan Home, she is a contributing editor for Aperture and www.eastofborneo.org, the collaborative online art journal and archive. With support from the Graham Foundation, the Beverly Willis Architecture Foundation, and the Smithsonian Institution, Morgan has been researching the life and work of writer Esther McCoy. She is editor of Piecing Together Los Angeles: An Esther McCoy Reader (2012), the first McCoy anthology, and cocurator (with Kimberli Meyer) of Sympathetic Seeing (2011), for the MAK Center at the R. M. Schindler House, West Hollywood, California. In 2014, Morgan was a fellow at the Georgia O'Keeffe Museum Research Center, Santa Fe.